I'm not sure when the attraction began but I have had a love affair with old metal chairs for many years now. I can't help it, they're just so darn cute in their funky styles and fun colors. Maybe it's because they remind me of the whacky & whimsical world of Dr. Seuss (they look like something that would have come from his imagination!). 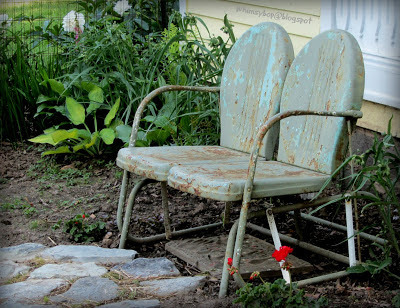 Maybe I love them for the nostalgic feeling that occurs each time I sit in one; always taking me back to those days of sitting in a red one beneath the shade of the apple tree in my Grandma's front yard. She also had a green tandem glider which I remember sitting with my Mom and waiting for the school bus to take me to my first day of kindergarten in the fall of 1970. Commonly referred to as "Motel" chairs, these bouncy and portable chairs made their debut just as WWII was ending and our G.I. 's were coming home. By the 50's and 60's, they could be spotted in front of motels, at poolsides, on front porches and in front yards making up the American landscape. I know this may sound like a shocker, but my first purchase was actually a pair of new reproductions on sale at Target in 1999. They were the perfect shade of aqua! I loved them so much I actually kept them inside of our home(s) for many years until I sacrificed them to the elements when we moved to our current home. 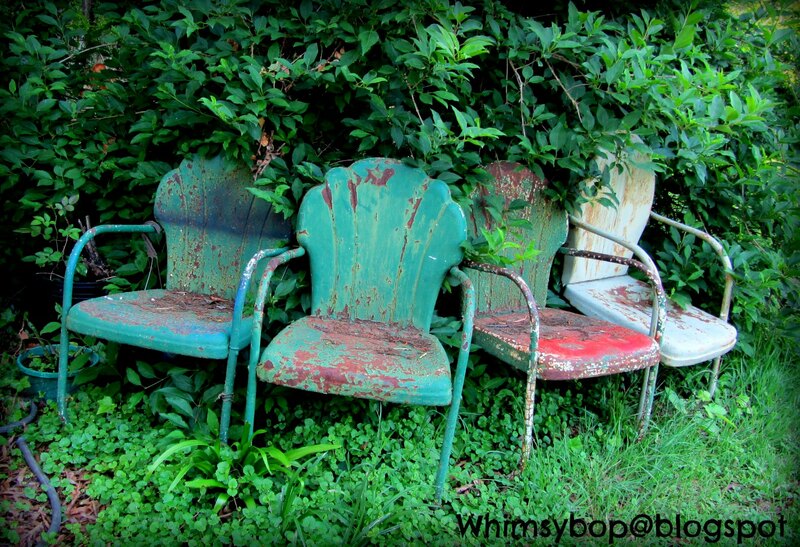 My first vintage set was practically hidden in a back yard covered in ivy and overgrown brush and weren't even for sale. I spotted them from afar and offered $10 for the pair to a man who was having a yard sale. He looked at me like I was crazy and gladly took my money. 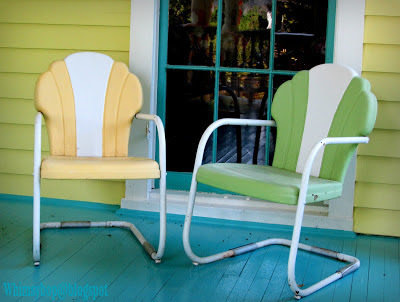 They were diamonds in the rough; covered in rust and layers of peeling paint, but once they were cleaned up and painted (yellow and green above) they were gorgeous! 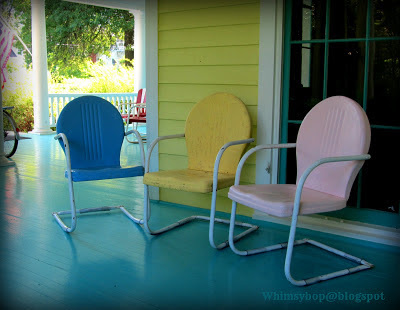 Soon I began dragging home every rusty motel chair I could get my hands on - within my budget, of course. I now have more chairs than I know what to do with (eighteen chairs and two gliders to be exact). The pretty ones are sitting on my front porch and the rest are out back in the garden, around the firepit and in the bushes (known as my chair graveyard) patiently waiting their turn for a good cleaning and a fresh coat of paint. To restore these old beauties, I find it easiest to first use a high powered pressure washer to remove the layers of dirt and surface rust - make sure they sit in the sun to dry thoroughly because the water gets inside of the tubes. Next, use steel wool to knock the rest of the rust off, then prime with a quality spray primer made exclusively for metal (I use Rustoleum brand). Finish the job with two coats of spray paint. 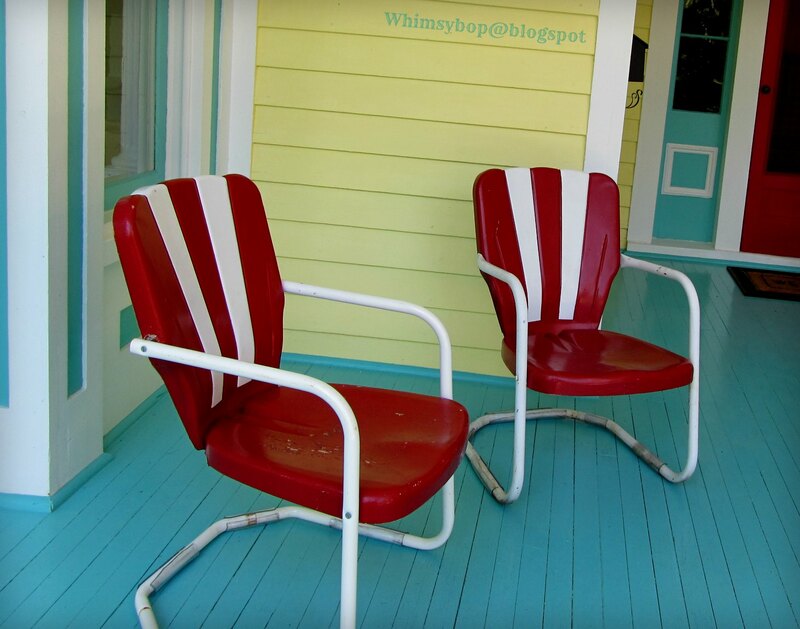 If your chair has a special design you want to highlight, don't forget to use painter's tape! To keep the chairs from leaving rust marks on our porch floor, my husband bought some clear tubing in the hardware store's plumbing department and cut them in small pieces to wrap snuggly around the bottom. Although these chairs are absolutely adorable, they are NOT made to sit in for long periods of time (sitting on a sheet of metal is never comfy). I highly recommend a pillow or pad of some type if you will be sitting for any duration of time. Also, be aware that because these chairs are made of metal, they get REALLY HOT when the sun beats down on them. It's also no fun to sit on them when the weather is cool - it's like sitting on a block of ice. 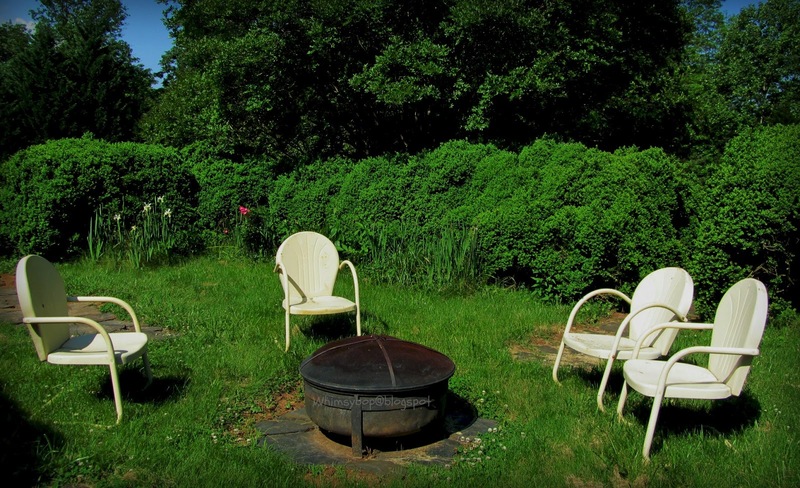 In the fall, when we sit out at the firepit, we each take two blankets - one to wrap up in and another to sit on. that saved a wretched chair like me. was purchased, loved, made clean. I remember that fun shopping trip with you, Kathy & Selina - we had GREAT fun that day! I still have that old desk (the kids use it as a computer table)and it's still as adorable as ever! Thanks for the trip down memory lane, Elena! 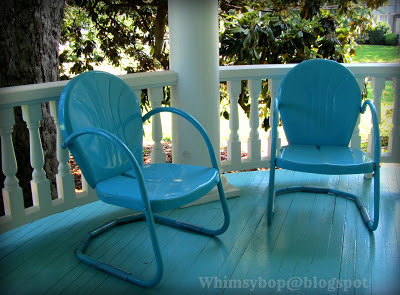 I love these chairs. I can't believe you have 18 plus 2 gliders. They are really pretty once painted. That is a labor of love. Using steel wool isn't one of my favorite things to do. You are quite the trooper.